While PS3 exclusive Uncharted is a hugely successful franchise in the West, it has yet to capture the Japanese gaming public's imagination. That's not because the Uncharted franchise is not very good — quite the contrary — nor is it because the series doesn't have appeal in Japan — I believe it very well could. The issue with Uncharted is that it's a new series. People aren't familiar with it. So when something like Uncharted 2 comes out in Japan, some people might be hesitant to pick it up, because they haven't played Uncharted 1. To rectify that potential issue, Sony is releasing an Uncharted pack. It contains Uncharted 1 and Uncharted 2. That way the reluctance to purchase Uncharted 2 without playing Uncharted 1 has been solved. However, it does give rise to another issue altogether: commitment. What if I don't like Uncharted? What will I do with this games? Am I really an Uncharted person? Does this dress make me look fat? Do. Not. Worry. Uncharted is a delightful gaming experience, Japanese gamer. And that dress does not make you look fat. Those pants, well. 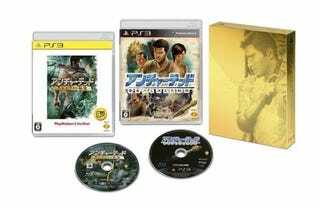 This Uncharted TWIN PACK is priced at ¥7,980 (US$87) and comes with a copy of Uncharted 1 (budget version, but hey!) and Uncharted 2 as well as a nifty box.